Blood Bowl game is a must for lovers of board games who want to combine football, fantasy and action in a game in which two races battle over a spiky ball to reach the endzone. 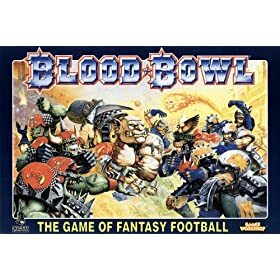 Blood Bowl is based on fantasy theme with football as the “excuse” for mayhem! It is a two-player game, with 11-16 players for each team. Like real American football, eleven characters can play on the field at a time. A board in form of a football field (made of styrofoam in early editions) is provided, on which the players have to score by entering the endzone of the other player by a team token carrying the ball. The game has the interesting fantasy characters, including Trolls, Dwarves, Orcs and Elves, each of which have their specific characteristics. Special characters, including Skaven, have also been created and there is a strong collector’s market for Blood Bowl miniatures. You choose one of these races as your teams and use its strengths (while minimizing the effect of weaknesses) to win the game. There are fun bloody, violent moves which are available to the players which they can use to smite, smash and crush players of the other team. The players compete is various types of leagues or cups, which differ in length and other aspects. During the league, the two teams fight each other and as the game progresses players get injured or killed and develop new abilities, just like a regular RPG. The crucial characteristic of the game is the turnover rule, in which if the action of the player fails then the turn of the team ends. Also, every team has four minutes to act. This makes the game fast and nail-biting as every move can turn the tables in favour of the other player. The Blood Bowl game has an appeal for football lovers as well as fantasy lovers through its fictional characters and football-style warfare. It has a fantasy story as background to the game with a character sketch of each player, but most fans will want to own the minis. There are fun events in the game which make it interesting, like the secret weapons available to the players. The game has sarcastic references to real life brands, products and football personalities. The third edition of the game makes it fast paced with the turnover rule and the four-minute rule, but the fun in strategizing and plotting that was present in the original and second edition is lost. If you want to buy the game or miniatures, you are limited to the UK. Looking for Blood Bowl games and accessories on eBay is the best bet. The Blood Bowl game holds charm for many: lovers of fast-paced games, action games, strategy games and sports games. With its different types of leagues, teams and match-offs, the game offers plenty of spice and variety. People who dislike fantasy or sport won’t enjoy it though. Maybe I just was not in mood for that game lately.